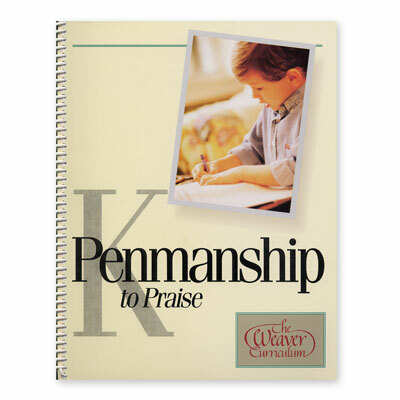 Each level of Penmanship to Praise includes Scripture to be used as copy work. The lower levels, like Kindergarten, offer shortened verses to introduce your child to writing on a daily basis. The Scripture verses coincide with the units within the five Weaver Volumes; however, you can pick a different verse for your child to write. This added benefit allows you, the homeschooling parent, to custom-design each penmanship lesson. Kindergarten Penmanship to Praise includes one-inch lines for practicing penmanship. Each week offers tips for improving your child's writing skills. Daily lesson plans take you through each of the first four days of the week. On the fifth day, your child chooses a border sheet from the back of the book. Border sheets have age-appropriate graphics that design the page. Once your child has chosen his border sheet, he writes his verse on it in his best handwriting. Then your child has the option of coloring and decorating his border sheet. This perfect copy can then be sent to friends and relatives to display his work. Border sheets include age-appropriate pictures, such as a bear, carousel horse, apple, airplane, car, and more! Order Weaver Kindergarten Penmanship to Praise from Alpha Omega Publications today and watch your child's penmanship improve!